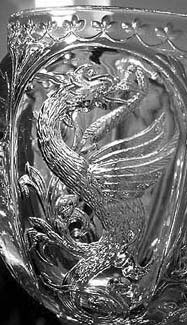 Glass engraved in such a way as to imitate the appearance of carved rock crystal became especially popular during the final two decades of the nineteenth century in Great Britain. The style was also used, in a somewhat simplified form for the most part, in the United States from about 1890. Firstly the glass has to be shaped by cutting, usually with pillars or roundels, from a thick blank to provide the basic shape. The pillared decoration by the glass cutter is extremely skilful, difficult and time-consuming as it is cut out of the solid with mathematical precision that belies its hand operation. Because the cutting is later covered by engraving this essential part of the process is often greatly underrated. The glass is next passed to the copper-wheel engraver who carves the finer details which complement the deeper cutting. For example the engraving may consist of leaves and flowers which grow out of the stems formed by the deep cutting. The third requisite is the polishing of the cutting and the engraving to restore the original polish to the glass. The Stourbridge factory of Thomas Webb and Sons, at the Dennis Glass Works, was the first firm to use the term “rock crystal” for entries in a pattern book that are dated 6 Jul 1878. Two of the company’s principle engravers were the Bohemian immigrants Frederick Engelbert Kny and William Fritsche. The latter is usually credited with introducing the style at Webb’s, but there is no documentation. Hajdamach suggests that “its introduction may have been a joint venture by the two great Bohemian engravers” (Hajdamach 1991, p. 238). William Fritsche worked intermittently for two and a half years on the masterpiece of this genre, completing in 1886 “Fritsche’s Ewer” a tour-de-force of “baroque power and rhythm” that can be seen at the Corning Museum of Glass (Charleston 1990, pp. 188-189). Stevens and Williams Ltd., Webb’s main competitor in the Stourbridge area, introduced rock crystal a year after Webb. Most of its rock crystal glass was engraved by John Orchard and Len Beach who often used designs created by another Bohemian immigrant engraver, Joseph Keller. After 1900 the additional firms of Webb Corbett and Stuart and Sons “made their own versions of rock crystal with a mixture of art nouveau and neo-classicism under the direction of two of Frederick Kny’s sons, William and Ludwig” (Hajdamach 1991, p. 247). 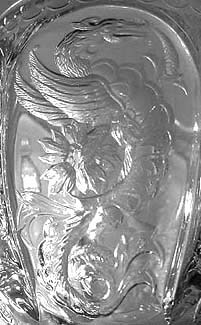 Mention of William Kny leads this discussion to the following item, engraved in the rock-crystal style. Although photographing cut glass so that all of the cuts will be visible is challenging, the problem pales in comparison to that experienced when photographing the polished engravings of rock-crystal glass. The first photograph shows the overall form of a mayonnaise set, but the engravings themselves are indistinct. Some of these are shown more clearly in the partial view of the set’s underplate in the second photograph. Eight panels are cut on each item. They contain either a floral arrangement or an aspect of a mythical beast, arranged alternately. 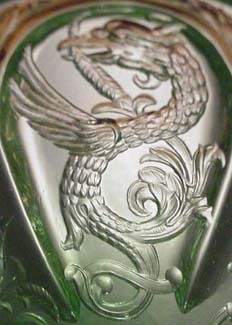 This pattern, called “Dragon” here for convenience, appears on the market from time-to-time, usually, but not always, accompanied by the monogram G. The engraved panels shown here closely match those found on other G glassware. In the case of this mayonnaise set, however, there is a simplification: the stylized engravings that usually surround the engraved panels have been omitted. Oval mayonnaise set. The dimensions of the bowl are L = 5.5″ (14.0 cm), W = 4.0″ (10.2 cm), H = 2.0″ (5.1 cm). For the plate they are L = 7.75″ (19.7 cm), W = 5.9″ (15.0 cm). Underplate is signed WKny; bowl is signed Hall. Note that the plate is viewed from the uncut side; the letter G, therefore, had to have been engraved as a mirror image. The bowl also has this monogram, engraved normally. The set sold for $400 in 1991. Amusingly, the seller of this mayonnaise set believed that it had some value because it came from “Something” Hall. Apparently he had visions of a stately home where it was necessary for the owners to label their furnishings! Fortunately, in spite of this, his asking price was modest. 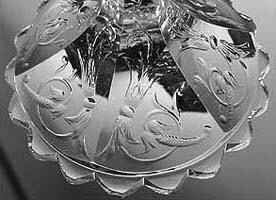 The mayonnaise set is a fine example of turn-of-the-century glass engraved in the rock-crystal style. It is possible that the mayonnaise set was originally part of an extensive table service known to have been made for Elbert H. Gary of U. S. Steel. All of the Gary items are also monogrammed with the letter G in a style that matches that found on the mayonnaise set. However, this style, a scripted G, seems to have been more or less an industry standard at this time. Therefore, it provides no clue as to the maker/origin of this engraved glassware. The story of the Gary service is a complicated one, and it is incomplete. Additional individual pieces are shown and discussed in The Fritsche/”Fritchie” Riddle section that concludes this file. Readers interested in the Gary service should also consult Spillman (1996, p. 253) who has been looking into this subject for many years. 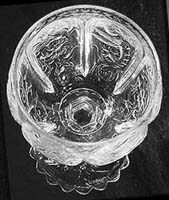 Though [Corning’s rock crystal] never equalled the high relief of the [Fritsche] ewer, the rock crystal of 1890 to perhaps 1915 combined three-dimensional wheel shaping [i.e., cutting] with representational copper-wheel engraving. Typically, medallions or curved areas called “pillars” were cut on a thick blank. These were engraved and polished, though many might also be ordered in the unpolished “engraved” finish. H. P. Sinclaire & Co. specialized in this work, and continued it after other companies began to produce cheaper interpretations of rock crystal. Corning was highly successful with its rock crystal. 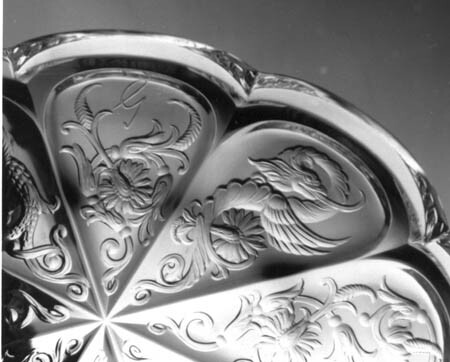 By the 1920s the term was used to describe the polished finish on engraved glass of any sort. Rock crystal was no longer necessarily the top line of the companies that made it, though often it was (Sinclaire and Spillman 1997, p. 25). A full-page ad in the April 1979 issue of the magazine Hobbies shows three example of rock-crystal stemware, each monogrammed with the letter G. The claret glass in the ad appears to be identical, in all particulars, to the claret glass that is shown below. This particular glass was placed in an eBay auction in 2003 by a seller in Washington, DC who acquired it from the estate of a collector of art glass. In addition to matching the “Dragon” pattern on the stemware in the Hobbies ad, the eBay claret has the signature “Fritchie” on the underside of its foot, as do some of the stemware in the Hobbies ad. In the following images this signature is the one on the top. The middle signature is found on a bowl, monogrammed G, in this pattern that is illustrated in Hajdamach’s book, where it is unequivocally stated to be a “fake” that is “likely” to be of English origin (Hajdamach 1991, pp. 391-2). 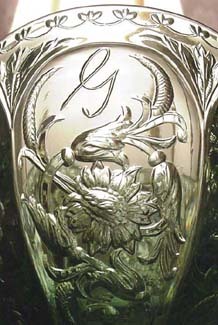 The third signature is found on a tall hock (white wine) glass, also with the G monogram, and again with the signature placed on the underside of the glass’s foot. The hock, with a solid green bowl, is illustrated below, following images of the eBay claret. The following signatures are not to scale. Only the third one has been measured: its length is 17/32″ or 0.53″ (1.35 cm). Each of these three signatures is unique, but it is clear that they were made by the same, careful hand. Five views of the eBay claret glass (advertised as a goblet), engraved in the so-called “Dragon” pattern. Signed “Fritchie”. H = 5.5″ (14.0 cm), foot D = 3.0″ (7.6 cm). Sold for $1,831.99 at an eBay auction in 2003 (Images: Internet). A tall hock glass, with a solid green bowl, that has a large ground and polished pontil and is signed “Fritchie”. Four of its six panels are illustrated here. These images are made available courtesy of the hock’s owner. H = 6.5″ (16.5 cm), rim D = 2.5″ (6.4 cm), and foot D = 2.9″ (7.3 cm). The hock sold for $25.19 in 1999. (Images: Private Collection). Before considering the Hobbies ad, it is worthwhile to compare some of the green hock’s panels to the mayonnaise set’s underplate, the Hobbies glasses, and the eBay claret. The first panel, G, (first row, center) matches the panel on the underplate that is in the 12 o’clock position. The photo of the hock’s panel has been taken from the “cut” side of the blank, the underplate from the “uncut” side; therefore, the images are reversed. (In addition, the latter’s letter G has been engraved in reverse.) The other three panels have been photographed from the “uncut” side, and, therefore, these images are reversed when compared to their counterparts: The hock’s second panel (first row, right) is identical to the Hobbies stemware where a dragon in this style is shown on all three of the glasses illustrated. It is also a close match to the claret’s panel that is illustrated here in the center position, except that the dragons’ scales are rendered differently. The hock’s fourth panel (second row, right) is the same as the underplate’s panel in the 3 o’clock position. It is clear from this comparison that the “Dragon” pattern has been used on all of these items with only insignificant variations, usually dictated by the size/shape of the individual panels. The Hobbies ad states that “Some pieces are signed Fritchie, some Kny, and some Hall” (note 1). This is partially, but only partially, confirmed by Spillman who states that the pieces in this pattern “which have survived are signed with the names of English engravers — ‘Fritsche’, ‘Hall’, and ‘W. Kny'” (emphasis added). She mentions Fritsche — evidence of which has not yet been confirmed — but not “Fritchie,” a signature frequently encountered (Spillman 1996, p. 253) (note 2). Note also that the Hobbies ad lists Kny, not W. Kny. The signature WKny, as on the mayonnaise set’s underplate, would seem more likely than an unadorned Kny signature. William Kny would undoubtedly have wished to distinguish his own work from that engraved by his father, the renowned Frederick Engelbert Kny, as well as from that engraved by his brother, Ludwig. A simple Kny signature would surely cause confusion. Frederick Kny signed few pieces, but when he did he used the signature F. E. K., according to Hajdamach (p. 161). He died in 1906, about the time when apparently much of this glassware was made. A dozen years ago the writer discovered that there is no record of an engraver named Hall in the Stourbridge district, according to the Broadfield House Glass Museum, Kingswinford. A similar inquiry sent to the Corning Museum of Glass in 1990 also received a negative response. Hall appears to be completely unknown; it would be useful to have information about him. Spillman states (1996, p. 253) that the pattern known here as “Dragon” is Stevens & Williams pattern No. 8675, information she received from that company after sending them a photograph of a glass in this pattern (see note 2). Because William Kny worked for Thomas Webb & Company — and never for Stevens & Williams — his signature on a S & W pattern is difficult to understand. Possibly the companies that William Kny was helping direct at this time — Webb Corbett and Stuart and Sons — undertook this work as subcontractors (note 3). The situation regarding William Fritsche, of “Fritsche’s Ewer” fame, is even more difficult to understand, complicated as it is by the presumably fake “Fritchie” signature. Setting aside the question of fakery for the moment — it is considered later — it is important to note that William Fritsche also worked only for Thomas Webb & Company, never for Stevens & Williams. At the time this glassware was made (c1900-c1910) he apparently was working independently as a free-lance engraver. As such he could have “helped” with any order in the Stourbridge area. He was producing quality engraved glass as late as c1920. But before considering the fake signature, it is necessary to examine the name “Fritchie” itself, which is of particular interest to collectors of American engraved glassware. An engraver named Hieronimus William Fritchie was working in this country at the time these items were made, and no engraver with this name and the ability to produce work of this quality is believed to have been working contemporaneously in England. The American Fritchie, who was born in Bohemia and worked for a time in Scotland and Ireland, signed only pieces that he made for his own use, and he used the signature “H. W. Fritchie” rendered in diamond point, according to Sinclaire and Spillman (1997, p. 145). No glassware in the “Dragon” pattern has been found signed with an authentic Fritchie signature (note 4). This statement includes later stemware in this pattern made by T. G. Hawkes & Company, apparently as replacements for damaged items in the Gary set (Spillman, pp. 253-4). Confusingly, Fritchie’s surname was originally the same as that of the aforementioned Bohemian-English engraver William Fritsche, but he changed it before emigrating to this country about 1888. William Fritsche himself always used the initial of his first name and he wheel-engraved his signature (Hajdamach 1991, p. 391); contrary to some reports, he never worked in this country. Traditionally, engravers have signed their own work with their own names and in their own hand. As we have seen, H. W. Fritchie signed his engravings using a diamond point, while William Fritsche used the engraver’s wheel. Now consider the situation where signatures are produced by means other than the engraver’s own hand. Should these signatures be considered legitimate? Or are they also a kind of forgery? Up to this point we have assumed that all of the signatures in this file were wheel-engraved by their respective engravers. This may well be an incorrect assumption. Spillman has observed that “. . . several signatures, especially some of Fritsche’s (sic) and at least one of Kny’s, seem to be acid-etched rather than engraved” (p. 254). Is the eBay “Fritchie” signature — the first one shown in this file — acid-etched or wheel-engraved? The second “Fritchie” signature is the “fake signature” that appears on Hajdamach’s bowl. Hajdamach believes that this signature “was probably made with a flexible drive drill” (p. 391). Incidentally, the pattern on his bowl, which has the familiar G monogram, appears to match our “Dragon” pieces, but the photograph is of poor quality. Neither pattern name nor provenance is given. 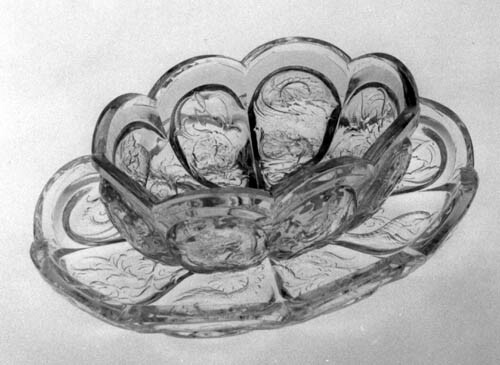 Hajdamach indicates that the bowl “was part of a larger English rock crystal service of nineteenth century date . . . (emphasis added). Additionally, the bowl is attributed to Kny (not William, but Frederick!). Regarding the mayonnaise set: At the time he owned it, this writer believed that the WKny and Hall signatures were wheel-engraved. Now he is not so sure. Regardless, acid-etching and flexible-drive drills — the visual effects of which are being investigated — may turn out to be unrelated to the signatures discussed in this file. The eBay claret glass confirms the fact that “Fritchie” is the name on some of the Hobbies stemware, as originally stated by the dealer who offered them for sale in 1979. There is no evidence that the name Fritsche appears on any of these glasses. c1905: E. H. Gary orders a set of tableware from Tiffany& Company that includes the claret glass. All items are engraved with the scripted letter G.
c1905-1934: The tableware is in use by the E. H. Gary estate. 1934: The claret is included in a set of 311 pieces of “Stourbridge” crystal from the Gary estate that is sold at auction (American Art Association/Anderson Galleries, Inc., 7-8 Dec). 1934-1979: The Gary service might well have been subdivided and dispersed at the 1934 auction. 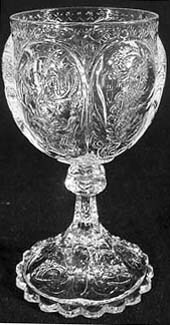 The following account, one of several that are possible, considers what might have happened to two portions of it, one of which could have included the claret glass. The stemware that appears in the 1979 Hobbies ad is believed to have come from the estate of the socialite and diplomat Perle Mesta who used part of the Gary service at the Washington, DC soirees for which she was famous. Other G-monogrammed stemware that surfaced about this time is said to have been held “in storage in Oklahoma City for about 40 years” (*). This Washington/Oklahoma City connection resonated with one correspondent who has sent the writer information about Perle Mesta’s father, William B. Skirvin, owner of the Skirvin Hotel, a luxury hotel in Oklahoma City at the time of the 1934 auction. This correspondent suggests that Skirvin might have purchased the Gary service, in whole or in part, for use on special occasions at the hotel. If so, the service apparently was divided after Skirvin’s death in 1944: Part of it was placed in storage in Oklahoma City and part of it was sent to DC for his daughter to use, which she did until her death in 1975. This second portion of the service was eventually sold at an auction of Perle Mesta’s estate. Two art-glass dealers bought some of it, then re-sold the stemware to the dealer who placed the ad in Hobbies magazine. Meanwhile, a collector purchased a matching G goblet or wine and sent photographs of it to the CMG for identification “about 1979” (*). She indicated, as mentioned above, that her glass had come from Oklahoma City and had been in storage for about 40 years. Coincidences suggest that this glass was originally part of that portion of the Gary service that was put in storage after the death of Mesta’s father. This particular glass should be readily recognizable because a section of the foot’s rim is damaged and has been repaired with a pair of staples. There is also an interesting — although frustrating — footnote concerning this item: One photograph of it has the notation, believed to have originated with the owner: “signed ‘Fritsche’ here on foot.” This is followed by a more recent note, written in a different hand: “Or ‘Fritchie'”! No signature is visible in the photograph. ?-c2003: The claret glass is in the collection of “the owner of Virginia Concrete, who collected art glass goblets over many years.” One wonders if he were collecting goblets at the time of the Pearle Mesta auction. c2003: The claret glass is sold to a new owner. 2003: The new owner sells the claret glass at an eBay auction (20 Feb). Acid stamps and flexible drive drills are complicating factors, but they do not invalidate the conclusion that all “Fritchie” signatures are fraudulent. Nevertheless, the existence of this signature — whether intentionally or inadvertently fraudulent — should not diminish our appreciation of the glass upon which it is found. This rock-crystal glassware, produced by a handful of English workmen at the turn of the twentieth century, is glass of the highest quality. Because it has received increased attention during the past few decades, any example — especially one with a Fritsche signature, which we now know should be signed WFritsche (Hajdamach, p. 451) — must be examined with care before being considered authentic. Fortunately, as we have seen in this file, English engravers other than William Fritsche were also producing first-class rock-crystal engravings at this time. This ability extended to engravers in other countries as well, including our own. However, few domestic examples of commercial glassware from this period are available today that match the high standard achieved by the “Dragon” pattern of the Stourbridge district as represented by the Gary table service of c1905. Although the Fritsche/”Fritchie” riddle was solved at the beginning of this section, and its implications have been discussed at some length, we must conclude with a question that may well prove to be unanswerable: Who, in the name of “Fritchie,” actually engraved the glassware that bears this name? The considerable amount of misinformation about Fritsche/”Fritchie” that is available has undoubtedly had an unhealthy influence on the buying and selling of this glassware. (The two examples illustrated in this file changed ownership for $1,831.99 and $25.19, respectively, during the past few years.) The present file is presented as a corrective that should help tame this extremism and restore rationality to the marketplace. It should also help answer some of the many questions associated with this fine glassware. ACKNOWLEDGMENT. The writer appreciates the discussions he has had with several cut-glass enthusiasts concerning material in this file; Bill Evans and Allan Waldron should be mentioned, along with Jane Shadel Spillman. Against all odds, the writer still has the latter’s letter of a dozen years ago. He is especially thankful that there was no e-mail in 1991! 1. In 1990 the writer attempted to contact the dealer who placed this ad, but he was unsuccessful. 2. Nor does Spillman mention Len Beach, perhaps because his glass lacks the G monogram. 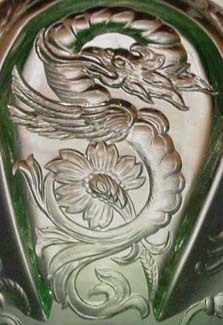 Beach, an engraver at Stevens & Williams, signed a glass in a matching “Dragon” pattern, identified as S & W pattern No. 8675, that is at the Corning Museum of Glass (acc. no. 79.2.221) (*). 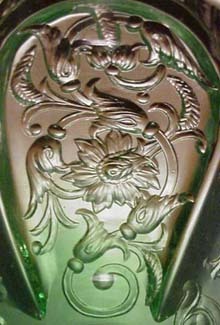 John Orchard was another S & W engraver whose name might someday be found on this type of glassware. 3. Spillman also sent photographs of the “Dragon” pattern to Thomas Webb & Company inquiring whether this might be a Webb design. She heard from the company’s unofficial historian who “did not think it was a Webb pattern.” Unfortunately, however, he apparently relied only on his memory and reached this conclusion without examining the company’s records (*). 4. And, apparently, neither has a “Dragon” glass been found with an authentic Fritsche signature. A letter indicating that some of the pieces in the first auction of items from the Gary service, held in 1934, were signed by Fritsche should not be taken as proof positive, because there are uncertainties in Spillman’s account (p. 253), in the opinion of this writer. Apparently there is no mention of either Fritsche or “Fritchie” in the catalog that accompanied the auction, only a remark that the glass to be sold was “Stourbridge” crystal. Recalling this auction three months later, Otto Bernet wrote in a letter that some of the glases were signed “by Fritsche,” but by that time he may well have confused the two sound-alikes: Fritsche and “Fritchie.” If the glasses in the auction included those that subsequently appeared in the Hobbies ad — as well as the eBay glass shown here — then they would have been signed “Fritchie,” not Fritsche. (*) Letter from J.S.S. (CMG) to the writer, 4 Jan 1991.